Thanks to a Photoshop crash and having to restart my Mac (shows you how seriously I fucked with PS), this took a little longer than expected, but allowed me to actually get it done way faster the second time, thanks to having abetter game plan. I'm actually surprisingly happy with this. Note: After Dexy's became a one-hit wonder, Irene went on to inspire Flock Of Seagulls to try a new haircut for which they became famous. There was a hilarious rendtion of "Come on Eileen" on the radio today where they (obviously) made it "Come on Irene"- what made it so great was that every now and then there was a random guy just shouting "YOU'RE A HURRICANE!" very enthusiastically and yet accusing all at the same time. I enjoyed it- plus it wasn't full length, it was about 30 seconds. Just enough. 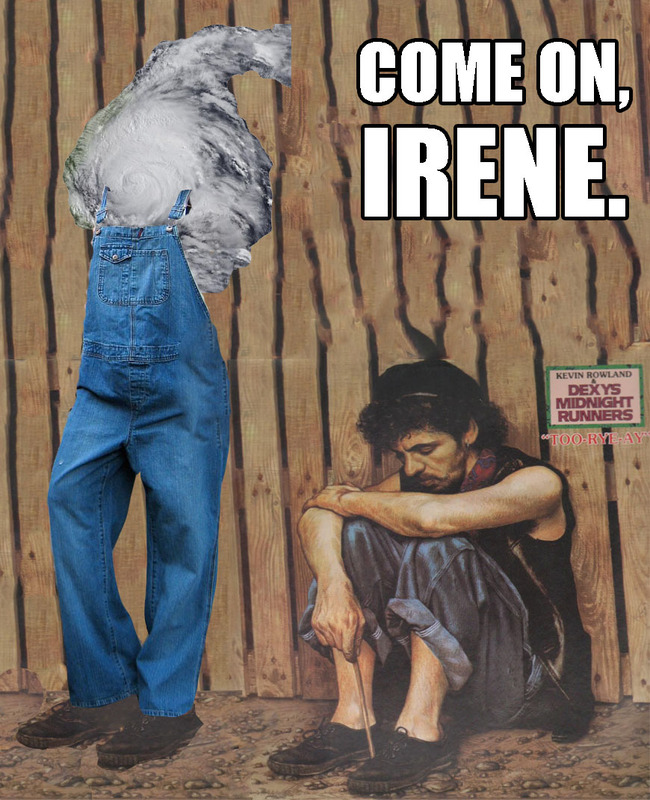 "Come on Irene.... YOU'RE A HURRICANE... I swear..."